I’m excited to share my first recipe here in awhile, and this is just the first of many! I’ve had so much fun experimenting with gluten-free baking over the summer, and have an awesome gluten-free chocolate chip recipe to share with you soon. But for now these will have to tide you over. There’s just something about chocolate chip cookie dough, isn’t there? Experience has told me I’m not the only one who can’t keep her hands out of the batter while making chocolate chip cookies. My family pretty much prefers cookie dough to the actual cookies. And while that used to be me as well, I’ve found I’m just as into the chewy, gooey cookie itself. A little crispy on the outside, and all melty on the inside…..all warm straight from the oven. So when I set about making these cookie dough balls, I wanted them to be gluten-free and low in sugar so they fit in with the Daniel Plan. I also wanted them to be healthy, and taste as much like chocolate chip cookie dough as they could. I’m not bragging, but these cookie dough balls are a hit wherever I take them. In fact, I’m always asked for the recipe. Friends have texted me on their way to the store just to find out which ingredients to buy. They are that good! They taste best when frozen (or at least refrigerated), but you’ll find it hard to keep your hands out of the bowl. Which do you prefer….the cookie or the dough? Add all ingredients in no particular order into a bowl and stir. I use my coffee grinder to make oat flour out of oats, to grind up coconut to make coconut flour and to grind any nuts I'm using. 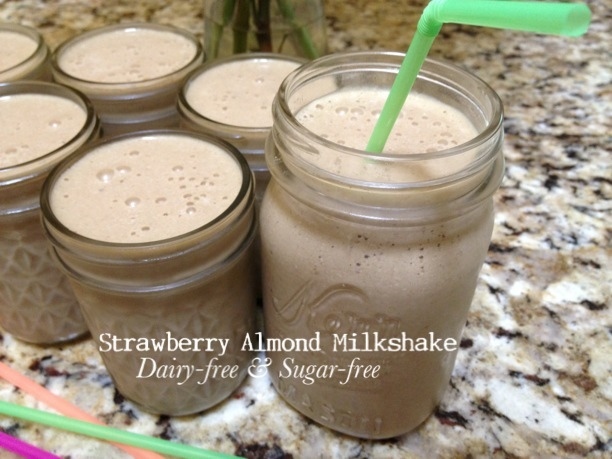 Very helpful tip and cheaper than buying almond flour. Roll into balls and freeze for 30 minutes. Can store in refrigerator or freezer. Hi friends! Life has a way of surprising you. Summer flew by….summer dragged on. Did it really even feel like summer? In many ways, not for me. This was the first summer in a long time my family and I didn’t leave the state and take a vacation. We missed our annual 4th of July family reunion, and though we had a great time with friends here at home….it just felt strange. A little off from the normal. And that’s okay! 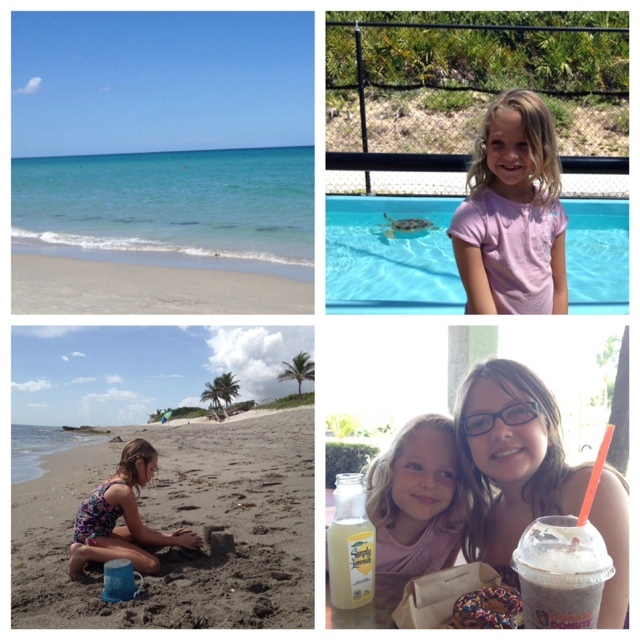 We hit the beach every week with friends (we have a huge homeschooling community in our area), enjoyed the free summer kid movies and had a blast when family came and visited us. We took friends out kayaking with us, and spent time in the library. As you might know, kayaking is a huge stress reliever for me and feels like a mini-vacation every time I go out. 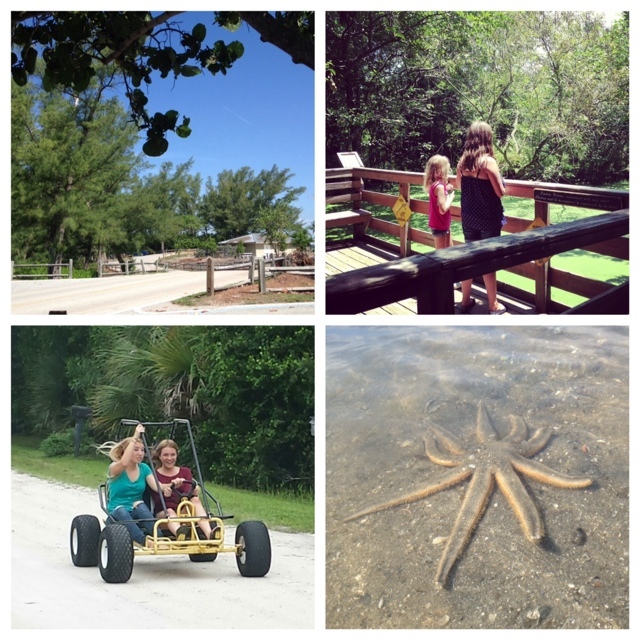 We are blessed to live in an area that tends to be a vacation spot. We live 5 minutes away from sandy beaches and the turquoise blue ocean…it really can’t get any better than that. But a change of scenery, a respite from normal is still highly desired by most and we are hoping to have a more adventuresome fall season, and perhaps some travel. How is it that fall is around the corner? Labor day snuck up on me…I had no idea it was this weekend. Really? We are now 2 weeks into the school year. We homeschool, and things are running smoothly. I have a feeling this may be our best year yet. Our girls are in 10th grade, 6th grade and 1st grade. Funny to have one in each category….elementary, middle school and high school. Our oldest is still running cross country with our local high school since she enjoyed it so much last year. It’s a great group of girls, and they have an awesome coach. So my poor neglected blog! I’m truly hoping to get back into the swing of things around here. I’ve been busy in my kitchen, and have all kinds of goodies to share. I’ve been experimenting with gluten-free baking, and adapting recipes to fit the Daniel Plan. I still feel best when eating gluten-free, and staying away from most dairy except for occasional cheese. I can eat gluten, but just feel better when I don’t. Anyone else out there new to gluten-free living? It’s been fun experimenting! 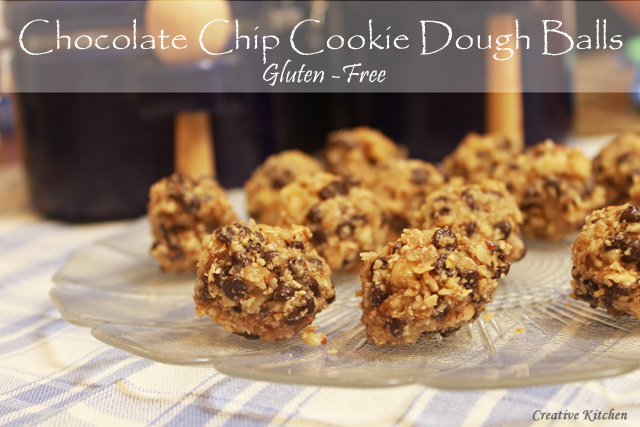 I’ll be back soon to share a new gluten-free treat….chocolate chip cookie dough balls. 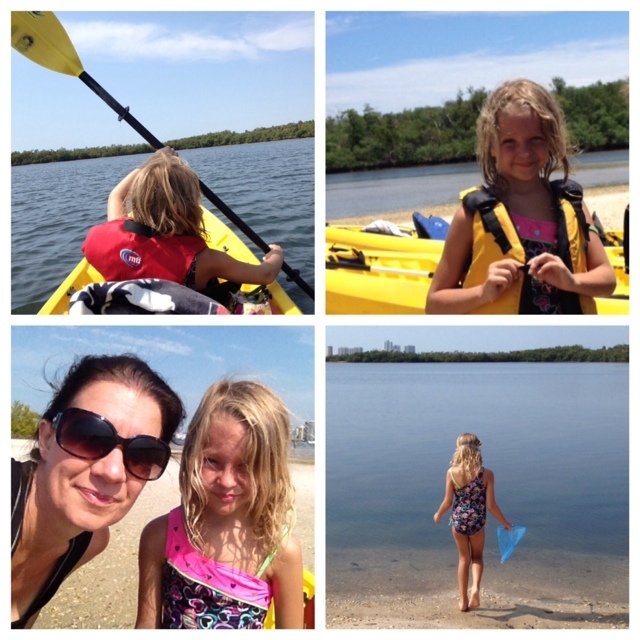 This was my little one’s first time kayaking! We had such an adventure, and we even brought one of her friends along (My friend & I were both out with our littles in tandem kayaks). We could have stayed out all day! Have you ever made popovers? Until a couple summers ago, I hadn’t. But they were fun and easy to make, and when I get through sharing with you….you’ll want to try your hand at them. You don’t even need a special popover pan! I just used a regular dozen sized muffin tin, and it worked perfectly! Another neat trick is that you make the batter in your blender…..just like when I make crepes or my puffy pancake (also known as a dutch baby). Even though crepes were easy, these were even more so because I could just pour them into my muffin tin and bake. And like the puffy pancake these definitely had a wow factor….but probably more so because when they puff up, they stay puffed up. Funny thing is there is no baking soda or baking powder used. My guess is it has to do with the eggs being whipped up in the blender. But I’m no scientist….. I found the recipe originally over at the King Arthur site, and adapted it to suit my needs. You know I have trouble sticking to a recipe, and this one was no different. If you haven’t been over to the King Arthur site before make sure to take some time there to look around. They have a lot of tasty recipes, and have a growing community on Facebook and are very friendly on Instagram! And though I like to mill my own flour, I still use plenty of King Arthur unbleached all-purpose flour in my kitchen. And now that I’ve been experimenting with gluten-free baking, I can’t wait to tweak a gluten-free version. These popovers are perfect with any sliced fruit you want to add….strawberries, peaches, blackberries, raspberries….whatever. But my favorite way will always be with butter, lemon juice, a sprinkling of powdered sugar and pure maple syrup. The lemon juice just takes them over the top. It’s my favorite way to eat crepes and dutch baby pancakes too. I made these popovers last June, and find it hard to believe I’m just getting around to passing them on to you. Seriously, where does the time go? It’s almost June again! What are your favorite toppings for crepes and popovers? Have you make popovers before? Tell me your experience! 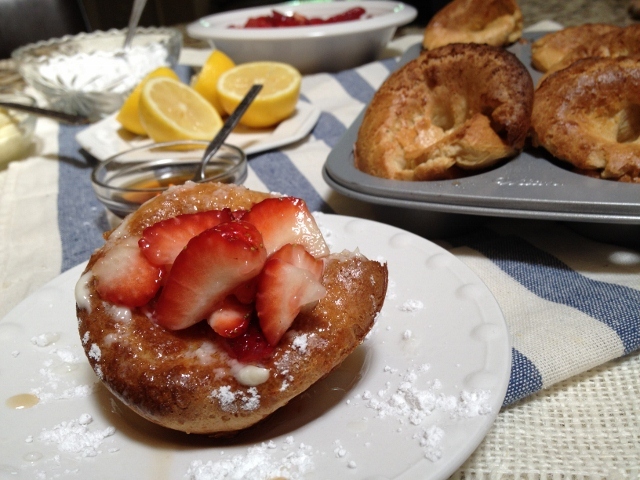 Quick & easy popovers are a fun breakfast for kids. Preheat oven to 450. Make sure you have a low rack to place popovers on. When oven is fully preheated, being making the muffin batter. 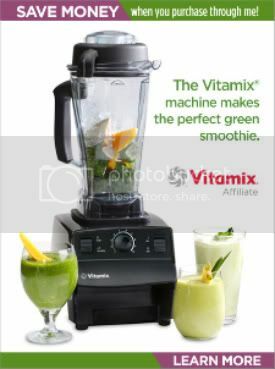 In a blender, blend eggs, milk, salt and nutmeg. Blend well. Add in flour and blend until thoroughly mixed. Add in melted butter, and blend until just combined. Pour batter into muffin tins until ⅔ to ¾ full. When oven is fully preheated, place popovers in oven and bake for 20 minutes. Without opening the oven door, reduce heat to 350 and bake for an additional 10-15 minutes. It’s Secret Recipe Club time again! This month I was assigned From Brazil to You. Denise is a trained chef, and was born and raised in Brazil. I had so much fun reading through her blog while trying to decide on a recipe. So many great recipes to choose from. I was excited to find these Yuca Fries. I’d never heard of yuca, but I realized I’d seen it before at the grocery store. It’s one of those vegetables I’d always wondered about. 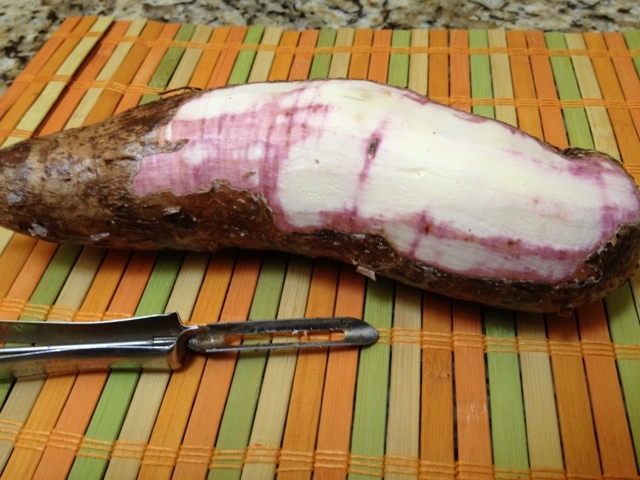 Now I know…Yuca is a root vegetable. I learned from Denise that Yuca or cassava is the third-highest source of carbohydrates in the tropics and consumed by half a billion people around the world. It’s also capable of growing in poor soil. I’m on day 22 of the Daniel Plan so was excited to find something from her blog on the plan. I always like to try new things, and have new challenges in the kitchen. The yuca was easy to peel. After that you cut it in 3 inch chunks and boil for about 15 minutes. The slice into fries and bake. It’s that easy. 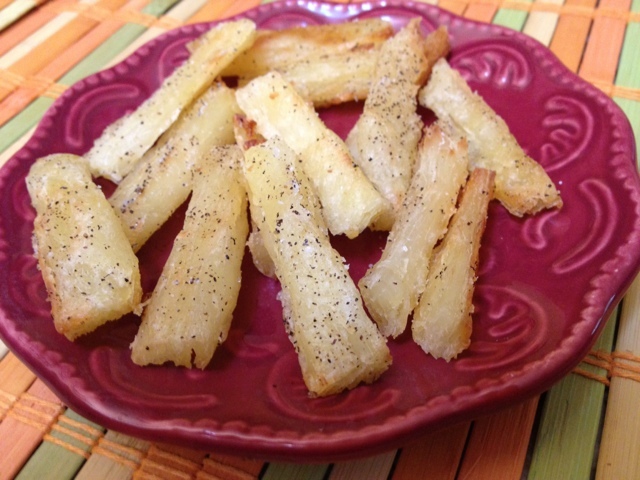 The Yuca fries turned out crispy and tasty. Be sure to stop over and visit Denise’s blog. Many hours of interesting reading and recipes to look through! Peel the rough outer layer including the purplish layer. Cut into 3 inch sections, place in boiling water and boil for about 15 minutes or until fork tender and the ends start to split open a bit. 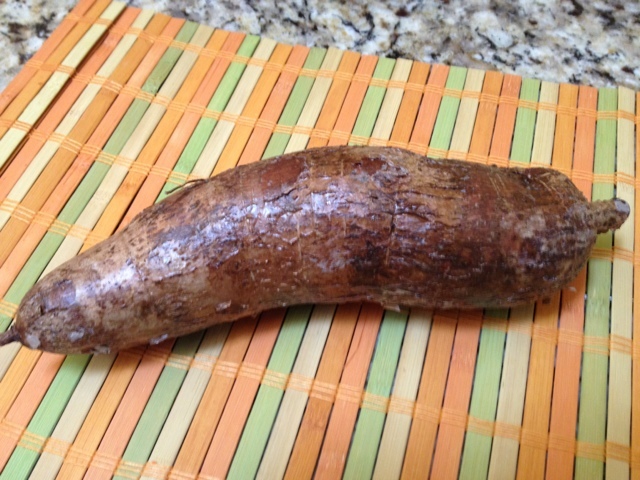 If you are using frozen yuca/cassava, just place into water since it's already peeled. Remove from water using a slotted spoon and drain on paper towels. When they are cool enough to handle, cut into half lengthwise and remove the thin woody stick that runs through the middle. Then cut them into sticks or desired shape and spread them out in a single layer on a baking sheet. Drizzle with olive oil, sprinkle salt and pepper and any herbs or seasonings. Fries are done when they are crispy on the outside and soft on the inside. Squeeze a little lime juice over them. Serve with ketchup or your favorite dipping sauce.